Scott Ritter, November 2002 - Three articles, written by the former UN- chief weapon inspector, about possible military strategies which would be used in an attack on Iraq, and on the possible consequences of such an attack. Operations Plan [OPLAN] 1003 has been CENTCOM's primary war plan for the past decade. OPLAN 1003 is really not a strategy or a campaign plan, but is rather a time-phased deployment plan for moving a sufficient number of troops into the theater to enable the US to defeat the entire Iraqi army, should the need arise. Allied forces, under the XVIII Airborne Corp, could include the US 4th Infantry Division (Mechanized), the 82nd Airborne Division, the 101st Air Assault Division, and a MEF. This is a unilateral USCINCCENT OPLAN which provides for the US defense of Kuwait and Saudi Arabia against an Iraqi attack. This OPLAN would probably be implemented upon receipt of unambiguous warning of an Iraqi attack through Kuwait into Saudi Arabia or an attack into Kuwait only. This OPLAN is in response to Strategic Capabilities Plan, Part V, tasking to prepare an OPLAN for the unilateral support of Kuwait and Saudi Arabia in the event of future aggression and for the support of US interests therein. This OPLAN also could provide for the security of US forces, citizens, installations, and resources in Kuwait and Saudi Arabia. US objectives are to coordinate and establish an effective force to deter and, if necessary, to counter aggression, prevent military coercion of friendly states, protect resources and facilities in the region, deny enemy access to the same, and ensure access to the regional lines of communication. The strategy of the US is designed to: deter war, improve regional stability, demonstrate a commitment to the region, counter hostile expansion and influences, and prepare for war. Should deterrence fail, the strategy is to rapidly deploy US forces to defend Kuwait and Saudi Arabia. Once adequate combat power has been generated and an adequate defense has been conducted, the strategy is to mass forces and to counterattack to restore the territorial integrity and legitimate governments of Kuwait and Saudi Arabia if they have been violated. USCENTCOM forces will conduct operations in three phases in order to: (a) deter Iraqi aggression into Kuwait and/or Saudi Arabia, (b) rapidly deploy defensive forces as far forward as possible to confront Iraq with a formidable defense, and (c) conduct an effective defense should Iraq choose to attack. The phases of the operation may overlap. Phase I. Deterrence (C-Day thru D-Day). At the first sign of ambiguous warning (threatening Iraqi activity), USCENTCOM will initiate Flexible Deterrent Options (FDOs) to deter Iraqi aggression into Kuwait and/or Saudi Arabia. FDOs, designed to demonstrate U.S. resolve and confront Iraq with the prospect of unacceptable costs for aggression, include all of the instruments of national power (economic, diplomatic, informational, and military). Phase II. Deployment/Force Build-Up (C+5 through C+90). In the deployment phase, emphasis is placed upon rapidly deploying from CONUS and OCONUS locations into the main APODS and SPODS at Dhahran, King Khalid Military City, Ad Dammam, Kuwait City, and Al Jubayl IAW the time-phased force and deployment list. Priority of deployment is to those forces necessary to defend the US initial center of gravity, which is the capability to deploy combat forces into theater. In order, those forces are fighter aircraft and electronic surveillance aircraft to conduct defensive counter-air operations; light, airborne, airmobile, or amphibious ground forces to protect PODS from ground attack; and command and control assets. Naval assets will deploy as rapidly as possible to the Arabian Gulf, North Arabian Sea, and the Red Sea in order to establish immediate control over the sea LOCs into the theater. Priority of deployment after the initial defensive forces (those that are critical to protecting the continued deployment) will be based upon the principle of providing (a) antiarmor forces, (b) long-term support forces, and (c) offensive-oriented forces, in that order. USCENTAF will be responsible for reception at APODS; movement from APODS will be the responsibility of USARCENT. The deployment phase will continue until all forces have arrived in theater IAW the TPFDL, but is expected to be complete NLT C+90. Priority of initial defense will be to: (1) APODS and SPODS that provide for continued deployment; (2) C2 facilities; (3) force assembly and build-up areas; and (4) forward defensive positions. Space systems will be positioned to provide support to the initial deployment. Priority will be intel/recon, communications, weather, multispectral imagery, and position/navigation systems. Phase III. Defensive (C+45 thru Indefinite). The defensive phase is designed to repel an Iraqi attack into Kuwait and/or Saudi Arabia. During this phase, the US center of gravity will shift to become our ground combat forces. This phase is sub-divided into three sub-phases designed to: (1) improve and strengthen defensive postures; (2) blunt and defeat an invasion; and (3) restore international boundaries with counter-offensive operations if required. This phase will terminate upon direction of the NCA based upon a decrease in the threat of aggression or the defeat of hostile forces. Sub-Phase IIIa. Defensive Posturing (C+45 thru D-Day). This subphase is designated to strengthen and improve the theater defensive posture established not later than C+45. This phase consists of the time between establishment of an effective defense and the commencement of hostilities. This phase may be as short as a matter of hours, or as long as a period of months. During this phase initial, alternate, and final ground defensive positions will be established well forward and improved to the maximum extent possible. Defensive air operations will be maintained at heightened levels commensurate with sustained operations capabilities. Naval operations will continue to insure the unhindered use of sea LOCs and prevent any Iraqi offensive naval operations in the Arabian Gulf. 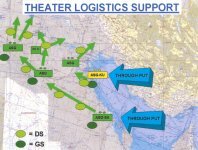 Theater logistics will be improved as rapidly as possible, and joint training will be conducted on a continuous basis. This sub-phase will continue until Iraqi attack commences, or until so directed by the NCA. Sub-Phase IIIb. Defensive Combat (D-Day thru D+7). This phase is implemented when an Iraqi attack is initiated against Kuwait or Saudi Arabia. During this phase U.S. air forces initiate theater counterair operations, interdictions, and close air support to gain air superiority, destroy, delay, disrupt, or divert attacking Iraqi ground forces. USARCENT and USMARCENT, supported by tactical air and naval surface fire support, will delay and attrite attacking enemy forces as far forward as possible, and establish in-depth defenses on suitable terrain. In the MARCENT portion of the theater of operations, defensive operations will focus primarily on critical ports, oil facilities, major population centers, and key terrain along the Arabian Gulf coast. In the ARCENT portion of the theater of operations, defensive operations will focus primarily on major population centers and resources of potential military value at King Khalid Military City, Hafar Al Batan, and the approaches to Riyadh. The ability to withstand chemical attack on friendly forces is dependant upon active chemical defense and through ATBM assets. This phase will continue until the enemy has been sufficiently attrited to allow counteroffensive operations, estimated to occur on or about D+7. If this phase commences prior to C+45, major combat forces will continue to deploy to the theater of operations and will be employed to reinforce the defense or to conduct counteroffensive operations, depending upon the theater operational situation. Sub-Phase IIIc. Counteroffensive (D+7 thru D+20). This phase will be implemented once force ratios favor counteroffensive operations. During this phase the ground forces of USARCENT and USMARCENT will initiate supporting counteroffensives to fix and destroy Iraq forces in their respective sectors. 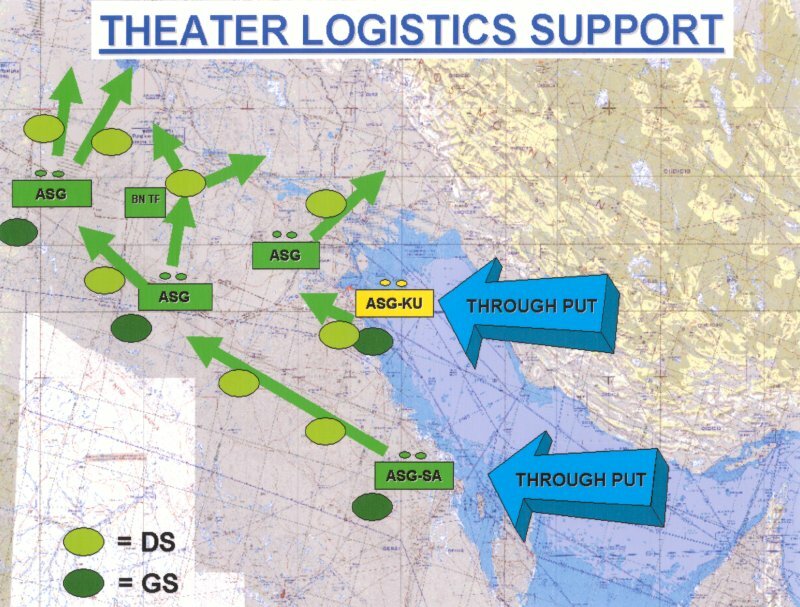 The theater reserve (designated by ARCENT), comprised of at least two heavy mechanized Div's, an ACR, and an aviation brigade, will then conduct the main theater counteroffensive to destroy the Iraqi center of gravity, which is the operational reserve, if it has penetrated into Kuwait or Saudi territory. If the Iraqi operational reserve has not penetrated into Kuwait or Saudi Arabia, the U.S. theater reserve will either be held in reserve and not committed, or will be committed in support of USARCENT or USMARCENT to destroy those Iraqi forces that have penetrated into Kuwait or Saudi Arabia. Only upon the direction of the NCA will offensive ground operations be conducted in Iraq. This phase will be terminated when all Iraqi forces have been expelled from Kuwait and/or Saudi Arabia and U.S. forces are again postured into adequate defense positions along the Kuwaiti and Saudi Arabian borders as per sub-phase IIIb (Defensive Combat) of this OPLAN. U.S. forces will remain in consolidated defensive positions until so directed to redeploy by the NCA. Post conflict operations will be conducted as required with USARCENT serving as the USCENTCOM executive agent for post-conflict operations. USMARCENT. Marine forces will initially establish a screen to provide early warning. Defenses along the FEBA will be established. Units in the defense will engage enemy forces as far forward as possible causing Iraqi units to deploy into attack formations and slow their advance. The movement to subsequent defensive positions will be delayed for as long as possible and must be coordinated with USARCENT, USNAVCENT, USCENTAF, and SOCCENT and must not occur until given permission by USCINCCENT. If required, a strong point defense will be established around Kuwait City as a last ditch defensive effort to save this facility. USARCENT. Army forces will initially establish a screen along the border to provide early warning. Defenses along the FEBA will be established. Army forces will also establish a security force of at least air assault division size and capability to guard and secure the theater flank. In addition, ARCENT will provide a heavy mechanized division as the theater reserve. Units in the defense will engage enemy forces as far forward as possible causing Iraqi units to deploy into attack formations and slow their advances. The movement to subsequent defensive positions will be delayed for as long as possible and must be coordinated with USAMARCENT, USNAVCENT, USCENTAF, and USSOCCENT and must not occur until given permission by USCINCCENT. If required, strong point defenses will be established around KKMC and Hafar Al Batin as a last ditch effort to save these critical facilities. USCENTAF (JFACC). The JFACC is the supported commander for counter air, interdiction and strategic attack missions throughout the theater in accordance with the JFC concept of operations. The JFACC will support land component commanders with close air support and interdiction within their areas of operation. During the defensive combat phase (phase IIIb), air operations will be focused on gaining air superiority, destroying WMD capability and destroying, delaying or disrupting Iraqi heavy forces. When the counteroffensive phase (phase IIIc) begins, air operations will focus on maintaining air superiority, close air support and interdiction. USNAVCENT. Naval forces will support the land battle by gaining maritime superiority, conducting coastal defense along the Kuwaiti and Saudi Arabian coast line, providing naval fire support, and participating in the air effort as coordinated by JFACC. Naval forces will make available to the JFACC all sorties in excess of those required for naval warfare task. COMSOCCENT. SOF will support the overall operations to defend Kuwait and Saudi Arabia. Special operations forces will deploy along the Kuwaiti and Saudi Arabian borders and conduct special reconnaissance and electronic surveillance to provide early warning to friendly forces. These forces will conduct operations within designated special operations areas (SOAs). Operations will not be conducted into Iraq without the permission of CINCCENTCOM. Upon initiation of hostilities, the SOAs will be terminated and the SOF forces withdrawn. The focus of SOF operations after an Iraqi attack will be against enemy C3 modes and line of communications. COMSOCCENT will also conduct and coordinate the theater CSAR efforts as required and will be prepared to conduct foreign internal defense operations with friendly nations in theater. There are three likely sequels to OPLAN 1003. The first involves a unilateral redeployment similar to what was done following Operation DESERT STORM in 1991, and the second involves a long-term defensive posture along the secured boarders. The third involves counteroffensive operations to include termination of the Iraqi regime. During the 1990s it is not evident that OPLAN 1003 included counter offensive operations into Iraq. By the late 1990s the Korean war plan, OPLAN 5027, had been revised to include counter offensive operations to terminate that North Korean regime. If this option was not included in OPLAN 1003 at that time, it was probably included in OPLAN 1003 by the Bush Administration. OPLAN 1003 is the basis for the widely discussed plan to overthrow Saddam Hussein. This large American military ground offensive would consist of over 200,000 troops and require a three-month buildup. This is not a new plan formulated in response to the Administration's call for regime change in Iraq, but is rather CENTCOM's long established war plan. Apart from the physical destruction of the Iraqi Army, one division at a time, and the aerial bombardment of every identifiable aimpoint in Iraq, OPLAN 1003 does not in and of itself contain a theory of victory that is focused on regime change. As is well known, the three month buildup required for OPLAN 1003 would provide ample time for Saddam to reposition his troops to complicate the American campaign, and to engage in diplomatic and terrorist activities to discourage American military action. According to Kenneth M. Pollack, a Senior Fellow and Deputy Director for National Security Studies at the Council on Foreign Relations who served as Director for Gulf Affairs on the staff of the National Security Council From 1999 to 2001, " ... it would make sense to plan for a force twice that size. Some light infantry will be required in case Saddam's loyalists fight in Iraq's cities. Airmobile forces will be needed to seize Iraq's oil fields at the start of hostilities and to occupy the sites from which Saddam could launch missiles against Israel or Saudi Arabia. And troops will have to be available for occupation duties once the fighting is over. All told, the force should total roughly 200,000 -- 300,000 people: for the invasion, between four and six divisions plus supporting units, and for the air campaign, 700 -- 1,000 aircraft and anywhere from one to five carrier battle groups (depending on what sort of access to bases turned out to be possible). Building up such a force in the Persian Gulf would take three to five months, but the campaign itself would probably take about a month, including the opening air operations." In July 2002 it was reported that the "CENTCOM Courses of Action" plan called for air, land and sea-based forces to attack Iraq from three directions - the north, south and west. Tens of thousands of marines and soldiers would invading from Kuwait. Hundreds of warplanes based in up to eight countries, including Turkey and Qatar, would conduct an air campgain against thousands of targets in Iraq, including airfields, roadways and fiber-optics communications sites. Special operations forces and covert CIA teams would strike facilities associated with Iraq's weapons of mass destruction and the missile capabilities. Special operations troops and airstrikes would seek to destroy chemical and biological weapons sites before the weapons can be used against an invading American force. The source who described the plan The New York Times expressed "frustration that the planning reflected at least in this set of briefing slides was insufficiently creative, and failed to incorporate fully the advances in tactics and technology that the military has made since the Persian Gulf war in 1991." In late August 2002, Michael O´Hanlon estimated that the deployment of combat forces to the Gulf would require the movement of perhaps 10 wings of land-based fighter aircraft, 30 to 50 ships, including three to five aircraft carriers, and four to five divisions of ground forces. Initial U.S. capabilities would consist of the 30,000 American troops already in place. By Day 15 another 50,000 more troops might have arrived. By the end of the first month of the buildup, another 25,000 troops might have arrived, mostly consisting of additional airpower and Naval forces. Another 100,000 troops could arrive within 60 days, bringing the grand total to about 200,000 troops. By O´Hanlon's estimate, the entire deployment could be completed in about 90 days, for a total of about 250,000 troops. The notional OPLAN 1003 counteroffensive operation regime change campaign plan would probably be to first seize Basra, and then attack up either the Tigris or Euphrates River valleys to Baghdad. Iraqi forces might be assumed to be arrayed to delay the seizure of Basra and to disrupt an advance toward Baghdad. Iraq would seek to buy as much time as possible, and to use his mobile forces to cut off Allied supply lines. Iraq might commit six divisions to the defense of Basra. In addition, three divisions might guard the border between Kuwait and Iraq, whose mission was to slow the Allied advance. Another three divisions, along with an armored division, might guard the highway south of An-Nasiriyah to delay and disrupt the advance along the Euphrates. Two motorized divisions might patrol the highway from Rafah north, in order to deny logistical support from bases in Saudi Arabia. To use the Rafah highway would require several days of military operations to clear Iraqi forces, thus buying Hussein time. The remainder of Iraqi forces might be arrayed to block key choke points along the major approaches to Baghdad. It might require many days of offensive operations to take Basra. It could require several more days to open up an attack route up the Euphrates or Tigris. Operations in the vicinity of As-Suwayrah could require at least another week, during which time Iraqi diplomatic efforts would focus on bring the campaign to a halt on terms not un-favorable to Iraq. In mid-September 2002 one British news report [London Daily Telegraph, September 13, 2002] suggested that US war plans would require a five-division assault on Iraq's southern flank, including four of its US divisions and one UK division. In the north, US airborne troops [possibly supported by Britain's 16 Air Assault Brigade] would occupy Kurdish-controlled northern Iraq. A Marine Expeditionary Force would mount an amphibious attack from the northern Gulf, which could involve the Royal Marines' 3 Commando Brigade. The British division was expected to be the HQ of 1 Armoured Division, with 4 Armoured Brigade and 7 Armoured Brigade [the so-called Desert Rats]. With logistical support, this would amount to a total of about 20,000 troops. The number of RAF aircraft in the region would be tripled, with the six Jaguars based at Incirlik in Turkey increased to 20, which would move to bases in northern Iraq prepared by US engineers. The number of Tornado GR4s would increase to about 30 aircraft based in Kuwait, and the number of RAF personnel would rise to about 5,000. The Royal Navy was expected to provide an amphibious carrier task force led by Ark Royal, which is on its way to the Mediterranean. The group would include the amphibious assault carrier Ocean, which is in the Indian Ocean, and would involve a total of about 4,000 servicemen and women.